November 21, 2010 by Alphageek in "alphageek", "review", "urbanspoon"
This is another excellent restaurant in the greater Fredericksburg area. We love stopping in on a Saturday afternoon, either before going out for the afternoon, or when coming home after a morning of activity. Okay, so maybe the Alphageek hates going out, but one does have to leave the house for supplies every once in a while. First a couple of background thoughts. I love Thai food. I will eat just about anything a Thai restaurant serves, with a smile of delight upon my face. That being said, it is somewhat ironic that I could eat at a Thai restaurant, even if they served only the "big four". What are the big four you ask? 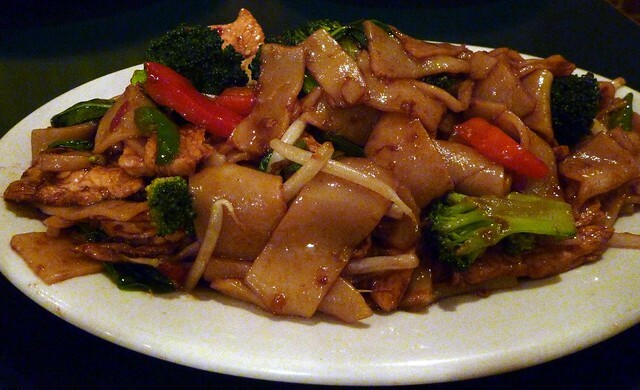 Simply put: pad prik khing, pad ka prow, pad thai and drunken noodle. Don't know what those are? Run and do a quick google search. After all, I promise original content, not regurgitating what other people have already written. Oh, and one more thing, I love spicy food. To the left here, we have pad ka prow. I have tried to make this at home for years, and was unsuccessful until I figured something out. This dish must be made with Thai basil. 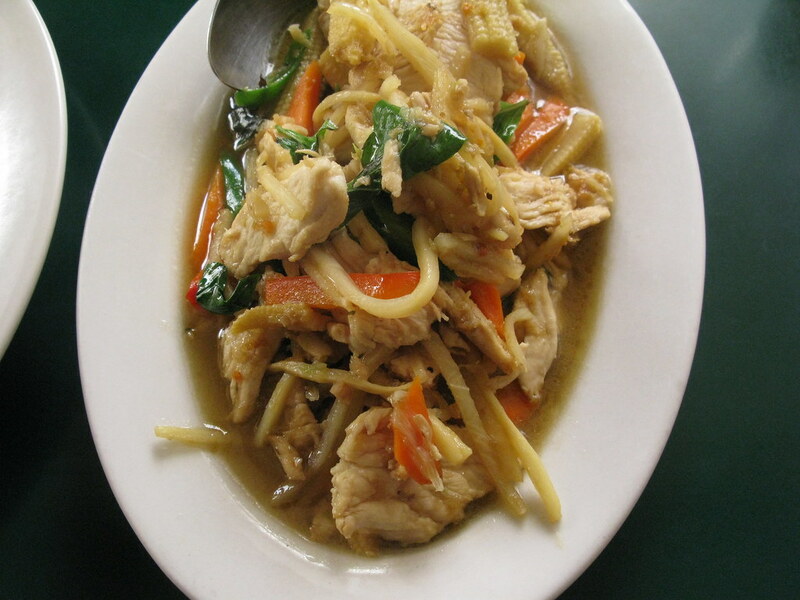 Thai basil gives it a slight licorice flavor, which brings out the other flavors of this dish. The basil, combined with the mildly sweet and spicy sauce, makes for a great set of flavors. They make a great plate of pad ka prow here at Garnjana. If you are brave, get it extra hot! To the right, we have pad thai, that Mrs. Alphageek ordered. I thought it looked delicious, and when she let me have a taste, my thoughts were confirmed. She did mention that the there were not very many shrimp in the dish, but that the lack of number was more than made up for in size and quality. The shrimp were large, and perfectly cooked, without being rubbery like shrimp that have sat out too long at a buffet. While I mentioned that I really only need four dishes at a Thai restaurant, I have had a few others. At Garnjana, I would also recommend anything they have on the special board. The last several times we ordered off the specials, we were not disappointed. This is anther great restaurant in town. Just thinking about Garnjana makes me realize it is nearly time for dinner. We stopped in last night and had another great meal. I just wanted to post a picture of my drunken noodles with chicken and say that it was a great as always.